Unreal set visit: What happens behind the scenes of our favourite show. "Everything I learned from spending the day on the set of my favourite TV show, UnReal." “Here” is supposed to be the set of UnReal, the game-changing TV show that delves into the behind-the-scenes world of a reality television. The show’s main characters, Quinn (Constance Zimmer) and Rachel (Shiri Appleby), are ruthless television producers who stop at nothing to produce the most outrageous, scandalous and yes, sometimes deadly, drama for their most loyal viewers. Their show is all about watching hopeless romantics attempt to find love on the fictional Bachelor-type show, Everlasting. Watch the trailer for the third season of UnReal, which is launching on February 27 exclusively on Stan. So when the “set” I arrived at looked more like the random warehouse where that online shopping order I never received is sure to be lost, I was… surprised. Where was the mansion? Where were the hordes of TV stars swanning around looking glamorous? And where was the forever-full, forever-free snack tent I’d heard so much about? I was expecting... THIS. Image via Stan. This, my friends, is where the magic of television is truly experienced. Because upon stepping inside those "warehouse" doors, the world of UnReal unfolded before me. Inside, I saw the complete facade of a Bachelor-like mansion. There was an area filled with fake trees that stretched five metres high until they just... stopped...covered in fairy lights to serve as an outdoor garden set. There were rooms that looked just like &apos;normal&apos; offices, filled with empty books and brand-new furniture that I instantly recognised from my days of binge-watching the show&apos;s first two seasons. These were the places where some of the most important scenes of the show had taken place. But there&apos;s something even more unique about a visit to the set of UnReal, and it&apos;s all to do with the drama&apos;s unique "show within a show" concept. You see, with a drama that focuses on the action that goes on behind the cameras of a TV show, it can be very hard to tell what is real and what is... not. As I made myself a coffee, I had a moment of sudden panic that I may have walked onto a hot set. While, for a split second, I imagined the director exclaiming "YOU! YOU ARE THE TALENT WE HAVE BEEN SEARCHING FOR! ", I was more worried that my need for caffeine had inadvertently ruined an entire season of my favourite show. I also made the mistake of asking an "official looking" person where I might find the bathroom. It turns out, the guy with a (fake) walkie talkie attached to his hip was not, in fact, a member of the crew but instead an extra who was just as clueless about what was going on as I was. During the tour around the set with the show&apos;s stars was where things began to get really interesting. It was led by Constance Zimmer, who, I must add, was sporting the most adorable pair of slippers and Jeffrey Bowyer-Chapman, who plays producer Jay. This is where I learned that it was not just me who was getting mixed up about what is real and what is made for TV. 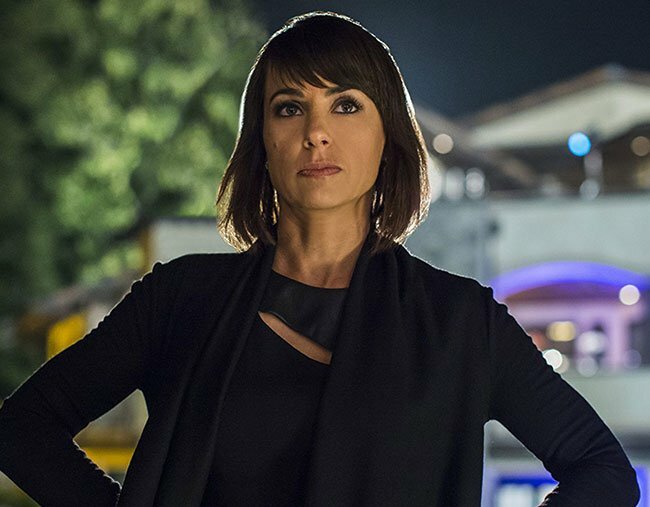 UnReal star Constance Zimmer gave Mamamia a tour around the set (in slippers!). "This is craft services [aka the snack table]...and this is, I think one, of the funniest sets for everybody, because everybody comes over here and thinks it&apos;s real craft service," Constance said. "This food is real, but... this is fake," she continued, tapping a plastic croissant on the table. "Every single day, an extra, or somebody will be in here eating it...and even I do it. But some of the stuff has been here for like, five years." The confusion on set is something that season three newcomer Adam Demos - an Aussie who&apos;s appeared on Winners and Losers, Home and Away and Rescue Special Ops - can also attest to. "It makes no sense whatsoever...it&apos;s nuts, it&apos;s so bizarre," he told me of the &apos;show-within-a-show&apos; style of shooting. "I remember the first scene I shot in season three. I turned up, it was the arrivals scene, when [the characters] meet the host and the Suitress. "It was surreal, because they called action for UnReal, so all the extras dressed as crew were running around. Then they called action for Everlasting and called my character out [of the car]. It actually felt like I was on a reality show, because you can see all the crew and everything. "You don’t know where [the show] stops and starts. It&apos;s weird." Aussie Adam makes his debut on the show this season. Image via Stan. Adam plays August, a "laid-back, surfie" Aussie looking for love on the third season of UnReal, which premieres on Stan this week. Unlike previous seasons of the show, season three is the first to feature a female suitor looking for love. It&apos;s a decision that star Shiri Appleby says will focus the show back to what made it such a groundbreaking piece of television in the first place. 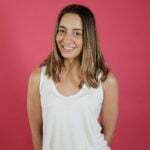 "We bring on a Suitress and so we got to have a conversation I was really interested in, which is: &apos;what are the obstacles of a successful businesswoman when it comes to finding love?&apos;" Shiri told Mamamia. "How do you deal with being more successful than the man you&apos;re dating? Not emasculating a man but being yourself... I found those questions that the show was asking really relevant, having been a working woman in my life and having dated. Shiri says the show "returns to its roots" in the third season. Image via Stan. "Seeing three women on television that aren&apos;t there to service a man&apos;s story and instead it&apos;s all about their success... that&apos;s pretty great. "I feel like the show sort of rooted itself back into what was most exciting about it to begin with... the feminist point of view." Season three of UnReal premieres tonight, Tuesday February 27 on Stan. Seasons one and two of UnReal are available to stream now in full on Stan. Jessica Clark travelled to the set of UnReal as a guest of Stan.